A consortium made up of Hochtief, FCC Construcción S.A. and A/S A.C.B. 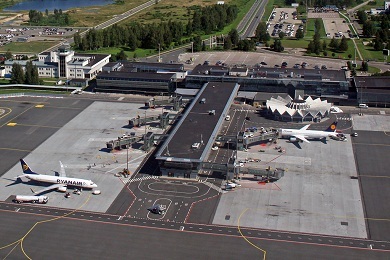 has won the contract to upgrade the infrastructure at Riga International Airport in Latvia. The contract has a total volume of around €79.5 million, the company said in a press release. Of this, Hochtief has a share of approximately €25.4 million. The project includes among others the construction of two new halls, new taxiways and de-icing platforms, as well as a new landing strip, runway and apron lighting. The refurbishment and drainage of the take-off and landing strips and the runways, and the extension of the apron with no disruption to daily airport operations will present a particular challenge. During the roughly 16-month construction period, around 204,000 square meters of concrete surfacing will be produced, approximately 56,000 tons of asphalt processed, and some 47,000 cubic meters of filling material used. The companies involved will start work in May 2013 and complete it by August 2014. The extensive construction measures are being undertaken to increase Riga Airport’s capacity, and improve the standard of safety. This is already the most important airport in the Baltic region, and is to be upgraded in the long term into a hub for North European air traffic. Be the first to comment on "Hochtief, FCC land Riga Airport upgrade"